Hi, my name is Pam Daugherty. I live in Quakertown with my husband Tom, my daughters Shelby (9) , Paige (6) and son Miles (2). I am a certified health and physical education teacher in Pa. I currently am a group supervisor for the before and after school program at Sellersville Elementary school in the Pennridge School District. I started running in seventh grade (I can’t believe it’s been twenty-eight years). After running the Presidential Physical Fitness run in gym class the track coach saw my time and talked me into going out for track. Running was something that improved my self-esteem. I also was able to run every day during all three of my pregnancies until the day before they were born. Shelby (our oldest daughter) has already run several 5k races and Paige is following in big sisters footsteps having run her first 5k in June 2010 . I guess they have learned that at a young age… After all both her parents run! 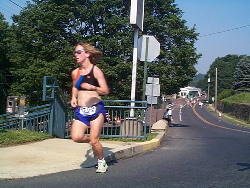 My husband was training for the Olympic Marathon Trials in the early 1990’s and has represented the USA in four World Duathalon Championships. He was ranked 24th in country in the 20K. My husband and I met at a 10K race in Bristol in 1991! He coached me my senior year in college and I went from the number five runner on our cross-country team to number one. . . And the rest is history.